Have you seen The Pioneer Woman Cooks yet? 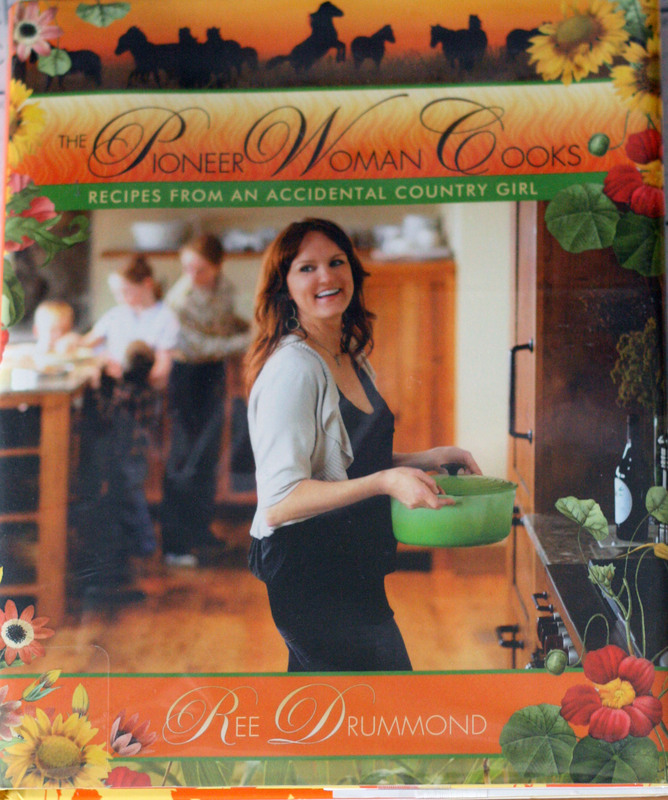 Written by Ree Drummond, this cookbook is the first published by the widely popular author of The Pioneer Woman blog. My order for this book at the library sat in line for quite some time as everyone was eager to see what was inside. And now that I've had a chance to thoroughly look through the book, I'm trying to figure out just what I think. Here's my verdict: this is a great cookbook, full of mouth-watering pictures and solid recipes that will most likely work for the masses, as well as being the perfect souvenir for those who follow the Pioneer Woman's blog, but it's not for everyone. If you love Southern, down-home comfort food, made from scratch this is a great book to peruse. If you are all about tons of fresh vegetables, lots of wholegrains and little refined sugar, you won't find much inspiration here. Ree begins her book by introducing her family, their ranch and how she got started as the Pioneer Woman blogger. For anyone interested in country life, the book is fun just to flip through and enjoy the pictures and commentary of what they do on the ranch. I did find the overall layout of the book to be just a bit too "scrap-bookey" for my taste. Color is everywhere, and of course there are gobs of pictures for each recipe, which may come in handy for those needing step-by-step instructions. The front cover of the book gives a good idea of the kind of layout inside the pages. It was hard for me to choose a recipe to try, as many of the recipes are not things I prefer to put on my table (as much as my mouth waters at their mention). I finally settled on Basic Breakfast Potatoes. The recipe was easy to follow and came out just fine. 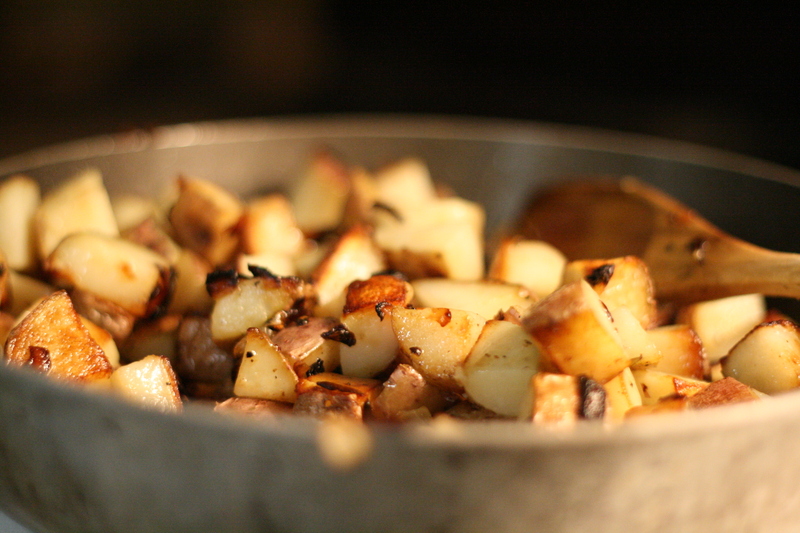 Place the potatoes on a baking sheet and bake in a 375F oven for 45 minutes, or until fork-tender. Place the hot potatoes on a cutting board and dice them into 1-inch-ish pieces. Heat a skillet over medium-low to medium heat. Next, put a little vegetable oil in the pan. A tablespoon is good. Scrape the pan you used to make bacon earlier this morning. You all made bacon this morning...right? Then, because I usually straddle the fence between ridiculousness and utter foolishness, I add a tablespoon of bacon fat to the skillet. 'Cause it tastes goooooood, that's why. Go ahead and make peace with yourself, then add the onion. Saute until it starts to turn brown. Next, throw in the cooked, diced potatoes. Now, sometimes I'll remove the onions first and wait to add them back in when the potatoes are brown. But I happen to like the onions to get all dark and burny, so I'm going to leave them. Salt and pepper the potatoes, then stir them around, then slightly press/pack them in the skillet. Cook without stirring for several minutes. You want to make sure the pan is hot enough to crisp the potatoes, but not hot enough to char the poor dears. NOTE: Sometimes, to make an interesting crust, I'll sprinkle a couple of tablespoons of flour over the top of the potatoes while the underside is cooking. That way, when you flip them they'll get a little crispy. In addition, a nice coating of paprika can give the potatoes a great depth of color. After several minutes, use a spatula to flip the potatoes over to the other side. Be sure to thoroughly salt and pepper the potatoes. Because no matter how you slice it, potatoes must have seasoning. Lots and lots of seasoning. Enjoy them! Spoon them into your breakfast burritos or place a fried egg on top...or serve them alongside eggs Benedict if you're feeling especially saucy. Now it's your turn to check out The Pioneer Woman Cooks and let me know what you think! I've vaguely heard of PW before but don't really know that much about it.. But my preferences in cookbooks tend to lean towards the lighter, fresher, more creative side. I'm not saying hearty, traditional food is not good (because it IS, baby!!) :-D but its so refreshing to experiment with an unusual souffle (Chocolate and Chilli, anyone?) or mess around with the ingredients of a salad or soup. That's what cooking is about for me. Plus I already have my tried-and-true methods of cooking, some of which were passed down through my family and some of which are my own inventions, mostly ALL the traditional dishes (e.g. guacamole, macaroni cheese, etc.) and I really DON'T need even more recipes telling me how to make those.. Traditional dishes should all have a basic recipe. How each person takes them from there is really a matter of personal preference really. I got this cookbook a couple months ago but I look at it more like a coffee table book almost. I like the pictures and stuff, but frankly the recipes are something I would only make on occasion, I'd weigh 400 pounds if I ate like that on a regular basis. The main thing that disappointed me about the book is that the majority of the recipes are already on her website. I was hoping for more "new." I love the Pioneer Woman-- a true "foodie." Her recipes and I have tried about 10 so far are wonderful. Photography outstanding. The Pico de Gallo to die for---cannot wait for her next cookbook! The beautiful frosted cupcakes looked absolutely gorgeous, the family loved them, everyone was raving about them and they made perfect gifts (took them to a friend in hospital who had just had a baby, apparently the intense chocolate + creamy frosting was just what she wanted after all that hard work!! ).